A San Francisco cable car holds 60 people. This blog was viewed about 830 times in 2014. If it were a cable car, it would take about 14 trips to carry that many people. Hakuna Matata: Does being happy make experiences feel more authentic? Weirdly, or perhaps not so weirdly, I discovered from the article featured in this post that watching the Lion King movie puts people in a good mood, and is often used in psychological research for that purpose. Alison Lenton, Letitia Slabu, Constantine Sedikides, and Katherine Power, used the Lion King to get their subjects in the mood for their 2013 study I feel good, therefore I am real: Testing the causal influence of mood on state authenticity. published in Cognition & Emotion. The study found that getting people in a relatively good mood (as opposed to a neutral or sad mood) correlated more strongly with their reports of feeling more authentic, or more themselves, after the target experience. The study included three different experiments, all arriving at the same conclusion. This study builds on others similar studies demonstrating that the self-reporting of authenticity is higher when people are in a positive mood; and that the correlation of positivity and authenticity in these self-reports. There are various reasons that this might be the case. Some are ventured (and supported through other studies mentioned in this article). For example, acting in misalignment with one’s inner self (lying) does not feel as good, and requires more effort, being transparent. The study is quite in-depth and offers many other fascinating insights, but for this post I can’t get past this: people think authenticity correlates with feeling good, and with good things. But does it? Authenticity is not about positivity or negativity. Authenticity, from a psychological and philosophical perspective, is about the alignment of the inner and outer selves. This study is so interesting because it is looking at affect (emotional state) and its relationship to perceptions of authenticity. A positive correlation between positive affect and authenticity suggests to me that people think they are feeling more authentic when they are feeling good, because authenticity feels good. (Hence why it is considered an experiential marketing strategy). Is this positivity an inner feeling (because we don’t have to exert the energy to pretend we are something we are not) or is this because we are conditioned to associate authenticity with happiness (even though catfishing makes some people feel good). Philosophers Kierkegaard and Heidegger, are two foundational figures of existentialism who spent quite a bit of time on the authenticity question. They did not feel that authenticity necessarily correlated to happiness or positivity. They did ascribe a positive value to aligning ones inner self, they didn’t really mean one would be happy. So, how closely related is happiness to authenticity? The cynic in me says that happiness positively correlates to authenticity because we want to believe that we are happier when our inner and outer selves align. But is that belief a a constructed version of ourselves, like our Facebook and Linked In pages? Or, is the relief of not having a facade, not having to fake our emotion, what makes us happy–even if we are miserable inside? Forget fris. Do you want authenticity with that burger? It seems the answer to the above question is “yes”. Mike Schallehn, Christoph Burmann and Nicola Riley just had an article published in the Journal of Product and Brand Management on Brand authenticity: Model development and empirical testing. Their study is fascinating because it attempts to do something that some in the authenticity world say can’t be done: measure authenticity, or at least its effects, empirically. Empirical research is a way of testing a claim directly and objectively. Often this method uses numbers, or ways of measuring phenomena. The numbers are then analyzed to see if there are relationships, such as one thing causing another. The issue with authenticity in an empirical context is that authenticity, like lots of people-oriented things, is tough to measure. The authors of this paper turn to psychology, a discipline that does lots of human behaviour measurement, to give then a framework they can use to test out the relationship between brand authenticity and brand trust–particularly amongst the 600 Germans who participated in a survey about beer and fast food. The findings suggest that authenticity is perceived when a brand is consistent, continuous and individual in its behavior. Nevertheless, the empirical results indicate that the factor individuality has the lowest influence on perceived brand authenticity. This is an interesting finding, as being “unique” is commonly regarded as an important success factor in branding. Although the study´s findings confirm its relevancy, they relativize its importance: Being consistent, meaning that a brand fulfills its brand promise at every brand-touch point and being continuous, meaning that the brand promise reflects the essential core of the brand, are of major importance. So making your brand unique is not as important as making it consistent and continuous if you are seeking to develop trust in the brand and therefore, as a consequence, a stronger customer attachment to the brand. So what does that mean for the Unique Selling Proposition (USP)? A mainstay of marketing? This study seems to suggest that it is more important to, from a branding perspective, know who you are and be that thing than stand out from the crowd. As we approach one of the most significant holidays on the Jewish calendar, Passover, I thought it was a good time to explore Objective Authenticity through the lens of Kosher certification of food. What’s Kosher? Aside from the Urban Dictionary slag definition (to be good, or cool), the word “Kosher” describes food that meets the dietary laws of the Jewish religion. These laws relate to what is eaten as well as the way food is obtained, prepared and eaten. Interestingly, according to Professor Timothy Lytton, who has just written a comprehensive book about the history of Kosher foods, less than 10 percent of people who purchase Kosher food do so because they live by Jewish dietary laws. The majority purchase it for other reasons, such as the higher quality and scrutiny over the certification of the food. Kosher foods are more expensive than their non-Kosher counterparts. Kosherness is not a premium that is necessarily identifiable; so certification is a key part of any food marketing strategy appealing to a Kosher consumer. In this scenario, producers pay a third party to audit their product, and put a certification on it. So the producer is not only saying their product is Kosher. they are saying “In case you don’t believe me, believe this third party trusted source too”. In an Autumn 2013, in article published by the Cato Institute, Lytton wrote “Kosher Food Certification as a Model of Private Regulation“. The article discusses how, in the 19th century, migrant Jews in urban areas of the USA (chiefly New York) could not rely on the government to regulate the “Kosherness” of foods. The problem was too big. The government did not have the budget or ability to police every link in the food chain (literally) to ensure adherence to Kosher law. Almost half of foods which vendors claimed were Kosher were not. What then emerged from a broken government system was a private, more effective free-market certification business, still in use today. Social networks provide a medium for trust and reputation that supports reliable private certification. At trade association meetings, participants from different kosher certification agencies socialize and pray together. The rabbis who manage these agencies also frequently hold positions of authority in their local Jewish communities, many as congregational rabbis or respected teachers. They interact closely with community members, who are also kosher consumers. Agency personnel form personal bonds with their food-industry clients, many of whom they have been working with for decades. Personal ties also exist among religiously observant kosher consumers, ranging from close connections between congregants to more extended Internet exchanges carried on through postings on kosher food websites. These various relationships constitute a complex network that enhances the regulatory performance of the kosher certification system by increasing social pressure to conform to industry standards and facilitating the diffusion of reputational information and consumer alerts. According to Lytton, the authority and trust of Kosher certifiers comes from both the proliferation of certifiers and competition in the marketplace for the service as well as the standing of key players in the community. The meaningfulness of the objective reality of “kosherness” is affected by the subjective standing of the people engaged in the certification process. This complex social structure is also held together by consumer vigilantism. Lytton indicates that a minority of Kosher consumers are particularly vocal about their suspisions when they spot something which is, well not “Kosher”. These consumers contact certification bodies and warn other consumers, spreading the word like wildfire. This societal pressure, where every counterfeit certification is a chink in their armour, has also spurred on certification companies to be hyper-vigilant about their reputation, engaging in expensive recalls when they discover an irregularity. What is interesting about the example of the free market Kosher certification analysis is they way in which objective realities (whether food meets kosher dietary laws) are reinforced by a constructed reality (the faith consumers have in the certifications, and the vigilantism that keeps the faith strong). The legitimacy of the certifications system is a socially constructed reality; and a fragile one at that. The pains that certifiers go through to ensure their legitimacy in the eyes of consumers is a way that the certification business can continue to survive. Interestingly, the need for certification is borne form the fact that vendors were so untrustworthy. What would have happened if vendors had told the truth about Kosher meat in the last century? Food producers would have kept a larger share of the food profits as they would not have had to pay for expensive certification programs and could deal directly with consumers. Lytton uses this system to say that private industry can help regulate a market if some key factors are in place, such as competition, consumer demand, interdependence, concentration of market power and customer vigilance. Perhaps the way we, in the authenticity analysis business, would look at the Kosher certification business is to say that Constructed Authenticity (the social web of legitimacy) is authenticating the Objective Authenticity (the fact that the food is actually Kosher), so that vendors can engage in Commercial Authenticity (where products are true to themselves so a premium value is legitimised) so that consumers can enjoy Existential Authenticity (a connection with the consuming experience). Objective authenticity relates to authenticity derived from the claims about an object being verifiable, for example, a pink Kimberley diamond from Western Australia or the red sequinned shoes worn by Judy Garland in The Wizard of Oz. Objective authenticity is the most straightforward of authenticity claims; but is it the most reliable cross culturally? An interesting recent article in PLOS ONE by Nathanial Gjersoe, George Newman, Vladimi Chituc and Bruce Hood asks this question, exploring the dimensions of objective authenticity across two cultures. In so doing, they draw an interesting boundary between objective authenticity and constructive authenticity. Their article “Individualism and the Extended Self: Cross-Cultural Differences in the Valuation of Authentic Objects”, studies the valuation of authenticity across cultures. Specifically whether the effect of value attached to unique person (like a celebrity) has the same value in India as it does in the United States. This study demonstrates that the perceived value of an authentic object differs across cultures. The researchers investigated the perceived value of objects that were authentic because if their age (such as a dinosaur bone) as opposed to objects that were authentic because of a contagion effect (such as an work by a famous artist or an article of clothing worn by a celebrity). Their hypothesis is that individualistic cultures will value objects associated with unique persons more than non-individualistic cultures will. However both cultures will equally value authenticity not related to persons. Their hypothesis is borne out in the study, where respondents from India and the USA were asked about the value tof objects that were authentic due to their intrinsic attributes (such as rarity and age) against objects that are authentic due to their extrinsic value (such as the people they may be associated with). What they found was that intrinsic authenticity appealed to both cultures equally. However, authenticity associated with unique persons was more meaningful amongst the Americans than amongst the Indians. The authors claim that this is because of the cultural difference between India and the USA: the USA is a culture that values the individual more than India does. Although this may indeed be the reason, I have a sense that there may be many reasons why the results of this study turned out the way they did. However, this post is not about what the researchers claim they found; it is about something they did not address at all that their findings demonstrated. Although this article is interesting in its own right, its by-product demonstrates something very important about the difference between objective and constructive authenticity: namely the boundary between an intrinsic authentic characteristic and an extrinsic one. Objective authenticity is something that belongs to an object. It can be confirmed or refuted by an external body. Constructive authenticity is about the authenticity, and value, placed on an object from outside the object itself (as it is constructed by the individual). The value of a celebrity connection with a product experience is such a great way to test this. As it turns out, which celebrity connection one makes–along with the concept of a celebrity connection altogether–can vary depending on one’s individual values. It also varies based on the communal values and beliefs in of a particular culture. The Indian respondents simply did not value celebrity connection to an object, even when the celebrity was someone who is held in high esteem in their culture. Literature on authenticity in marketing and leadership focuses primarily on the generator: the marketer, the leader, the firm trying to communicate authentically. Few studies have focused on the receivers’ participation in what the producer is trying to convey. Authenticity, and the value that arises from it, is not just about what the producer is doing. It is about what the consumer is prepared to receive. One of the best movie scenes that illustrates this from the Australian movie Priscilla Queen of the Desert, about three drag queens trekking to a gig in Alice Springs. In the scene, Felicia (played by Guy Pearce) shows Bernadette (Terrance Stamp) her most prized possession in the world, an authentic souvenir from her idol: Agnetha of Abba fame. An explanation of what it is, and how its authenticity was verified by Felicia, both mystifies and horrifies Bernadette. When marketers are expending resources crafting authentic experiences, one question they can sometimes fail to ask themselves is whether this kind of authenticity has value and if so how much? Like brand equity or price elasticity, the value placed on authenticity is not absolute and should be tested. Buckle your seat belts. Is Authenticity an emotional vehicle with a bumpy ride? The most recent issue of the Journal of Service Management features an article by Ruth Bolton, Anders Gustafsson, Janet McColl-Kennedy, Nancy Sirianni and David Tse proposing that businesses look at the specific customer experience as a differentiation strategy. As they point out in “Small Details That Make Big Differences: A Radical Approach to Consumption Experience as a Firm’s Differentiating Strategy”, many businesses compete in the same space: similar products, prices, locations, experiences. When looking at process improvement, they often look at efficiency and effectiveness across the board. Rather than doing that, Bolton et al suggest that they look at small differences that have an outsized effect on the customer experience. Bolton uses an aged care home facility as an example. They installed an espresso machine in their wards in order to have each resident greeted in their room each morning with a high quality coffee of their choice. This small act has an outsized effect on customer perceptions of their experience; and therefore is an efficient and effective way of increasing customer satisfaction. Moreover these small differences can carve out a specific place in the market for a firm, and are tangible evidence of a greater value proposition (in this case about the care they take with their residents). Is authenticity a differentiating strategy? Bolton et al discuss authenticity specifically in terms of emotional engagement. They posit that a service can be efficient and effective; but without an emotional connection, customers will not develop an affinity to the brand. And that won’t happen without an authentically delivered emotional component, emotionally engaged and passionate staff, a “human touch”. Authenticity as a differentiator is not a new idea. The literature on authenticity, specifically from a service perspective is growing (and is, in fact, one of the reasons for this blog). From an evidentiary perspective, it is hard to quibble with Bolton et al. There are issues that arise out of authenticity’s role in what is otherwise an interesting and relevant article. First, authenticity is not a “small differentiator”. Unlike the other examples they cite in the article (the coffee), is a massive thing, which is difficult to implement. It may have an overall effect but that may be hard to measure. Regardless of that, lets say that authenticity is achievable as a point of difference in the market. Let us assume that there are a growing number of firms putting authenticity, emotional engagement and delight on the customer agenda. Imagine customers are moving through their lives, gravitating their consumption experiences toward the emotionally engaging, favouring vendors who have energetic, passionate, caring, staff. Ideally, this emotional labour is factored into the cost of the service. Let us assume that firms can therefore link amount of “emotional taxation” in their service to revenue growth or market share. A world such as this creates expectations. We know that people, whether at work, at home or on social media, are rewarded socially more for being happy than being human. This “positive bias” referred to in earlier blogs is the authenticity firms are looking for. After all, customer service agents, are not encouraged to be authentically grumpy are they? And yet, positive bias is antithetical to authenticity. Authenticity is not the smooth run of a joyful customer journey. It is the bumpy ride of the different people in the process and their different personalities. The challenge for workers to be authentic, but perfect and pleasant, is the elephant in the “authenticity room”. Although Bolton’s paper is not one about the broader assumptions and impacts of authentic emotional engagement in the transactional world, it does pose the question: Do we want a smooth manufactured one or a bumpy authentic one? Ads in the Digital Age: Does more entertaining = more authentic? Zhihong Gao , Hongxia Zhang & Sherry F. Li address some fascinating questions in their 2014 article “Consumer Attitudes Toward Advertising in the Digital Age: A China–United States Comparative Study” in the Journal of Current Issues & Research in Advertising. As they point out, advertising in the digital age is not just more pervasive than ever before; part of the digital advertising experience is not just about exposing your to messages, but is also about capturing your behaviour in order to more effectively sell to you in future. The study demonstrated that when advertising reaches saturation point it begins to have a negative effect on the consumer’s perception of advertising, and often associated institutions. The authors point to the dissatisfaction rating with Facebook, tied to its increased advertising presence and more pervasive data collection of its users. Why would entertaining advertising be somehow more acceptable than informational advertising? And why would the halo effect of making advertising content entertainment not only affect the institution but also affect advertising in general? One of the reasons this is an important question is because advertising in the digital age goes beyond traditional broadcast content (like TV), search engine sponsorship (like Adwords) or banner ads. Institutions, commercial and non-commercial alike are competing with each other for eyeballs across the internet by developing content they hope will go viral amongst their audience. an old standby in traditional advertising is to make your ad so entertaining that people will watch it again and again; in the digital world that usually results in a viral ad: the gold standard of content creators everywhere. Do viral ads lead to more sales? It worked for Blendtec, a blender company that, with their Will It Blend channel uses their product as a kind of postmodern form of entertainment. Although their blender sales did not increase at te same rate as their page views, they reported exponential sales in their product since the campaign commenced. But then it might not work for everyone, as there is no evidence that the cute and cuddly Budweiser Superbowl ads lead to more Bud consumption. The ads that go viral for the right reasons (their entertainment value) do demonstrate their ability to resonate with us on an authentic level, cutting through the noise and jabber of ubiquitous advertising to speak to something in us. And they do this through understanding cultural cues that trigger genuine emotion. When we watch the puppy and horse in the Bud ad engage in an anthropomorphised relationship, we know that the connection is unlikely. We know that the horse is a Clydesdale, a totem of the Budweiser company. But it pushes buttons in us that makes us want to see the puppy united with that horse over and over again. Constructive authenticity is about using cultural codes to engender authentic communication of key messages. For Blendtec, who recently used their product to blend an iPhone 5 (destroying consumer electronics is a mainstay of their videos), the key message they are sending is that their blender is powerful. The way in which they send it is through a television mainstay tropes of game shows and mad scientist laboratories. They also gleefully destroy things, which has also been a broadcast television mainstay, often on late night TV. By combining these cultural tropes, they create a sense of entertainment, as well as nostalgia and authentic connections. One indisputable take away is the development of the “dividual” concept. Although this concept is a side note in a larger conversation about the self online, it is undeniable. Mechanisms like Twitter allow us to develop a specific part of ourselves and only that part: Twitter’s brevity and anonymity (if desired) encourages dividuation, not individuation. However, Google+, LinkedIn and Facebook have, as an underlying vision, that people who join do so with genuine identities. There are several ways they ensure this. First, it is easier to find someone and link to them if they use verifiable information: name, age, location, schools attended, employment and so on. Secondly, they regularly look fo signs that the user is not a genuine person and attempt to rid their service of those “imitation people” inasmuch as they can do so. Their (advertising) business model is more viable if everyone on Facebook equals a genuine person in the offline world, and if the details about their identity are disclosed accurately. Facebook, Google+ and LinkedIn want individuals, not dividuals. Twitter, on the other hand, does not care. You can have several feeds set up, and be tweeting and retweeting about each of those individual interests simultaneously. Previous posts on this blog have addressed the positive bias in individual Facebook engagement. In other words, when people put up positive posts they receive more response, engagement and affirmation from their social media audience than if they post neutral or negative posts. This pressure to be happy, self-fulfilled and becoming the best version of ourselves is one that has been argued as being a first world problem. This pressure, or social anxiety, is one that has been the discussion of philosophers, and psychologists for decades. Marketers have been leveraging this kind of anxiety–and still do– to sell everything from weight loss programs to consumer goods to, well, participation on social media networks. People who use social media as a personal branding exercise are seeking affirmation, engagement, and association–and therefore must bow to the social pressures within their networks to act in a way that will allow them to develop their optimal networked audience. That usually means coming across as happy, self-fulfilled, expert and may even extend to looking a particular way in their photos. Brands who use social media to extend their customer engagement or sell online also seek to optimise their audience reach. They default to positive bias (very few businesses can get away with being rude or grumpy to customers). Their workers are engaged in emotional labour, especially those at the front line who engage with customers. This develops a kind of organisation-wide, or maybe even industry-wide, social pressure felt by the individuals within a firm to both their customers and non-customers. One of the interesting ways this is playing out at the moment is in an industry not known for its friendliness: academia. Social media has let loose the ability to gripe and explore the various ways in which the academic system does not lead to happiness. So much so that the new Academic Kindness blog stands out in stark relief to other, more popular posts about academic life. Interestingly, as higher education websites become even more marketing savvy and attempt to push their media presences toward a positive bias, there is a discourse in the industry about how unhappy people in the field are. Government funding is harder to access, budgets are cut, fees go up, jobs are insecure and employment outcomes for students seem more out of reach. The disgruntled online presences are “dividual” accounts of university life, as much as the packaged, slick, positive university marketing materials are also “dividual” accounts of university life. There is an element of authenticity, and inauthenticity, in each. One approach to this problem would be to engage in a narrative about the problem itself, letting the outside world into the internal struggle about how much to disclose and the approach toward social media anxiety. In a study discussed in an earlier blog post on this site, a blogger engaging in a seeded blog promotion activity actively discusses the ethical issues involved in accepting the product and blogging about it with his audience. By doing this, he is letting people in on his inner world and how it manifests in his outer world. Should he accept the product? (He ends of doing so). Does that mean he has to blog positively about it (He ends up giving what he feels is a balanced perspective.) Is he flattered by the attention he is getting from the commercial company, who recognises his audience reach (He is.) Is he open to receiving more free stuff? (He is.) and so on. He steps this out in a series of conversations with himself in his blog and conversation with others recorded on to his blog about the issues. All of this is done in the same voice and tone as in the rest of the blog. He is letting us into his world in an existential self. Heidegger would approve (I think). If brands seek to engage in authentic behaviours, they will have to act less like brands and more like people. Although this has been attempted, and at times successfully, it is counterintuitive in the marketing world and comes at a cost: transparency may mean less “likes” and less “friends”: both metrics that online marketing managers hold dear. In the northern spring of this year, Linnaeus University Masters students Guia Tina Bertoncini and Maria Teresa Schmaltz published their study on the millennial generation and their perceptions on social media through various lenses. A majority of the respondents indicated they felt that social media increases the chance to represent a distorted self-image to others. At the same time a majority of respondents indicate they represent “nothing but my authentic self” on social media. A majority of respondents also indicated that they put both positive and negative aspects of of the “real me” forward to others (generally); which is interesting, as research has shown–especially on social media–that people tend to display more positive versions of themselves on social media, as this “positive bias” is what generates the most positive response from an online audience. 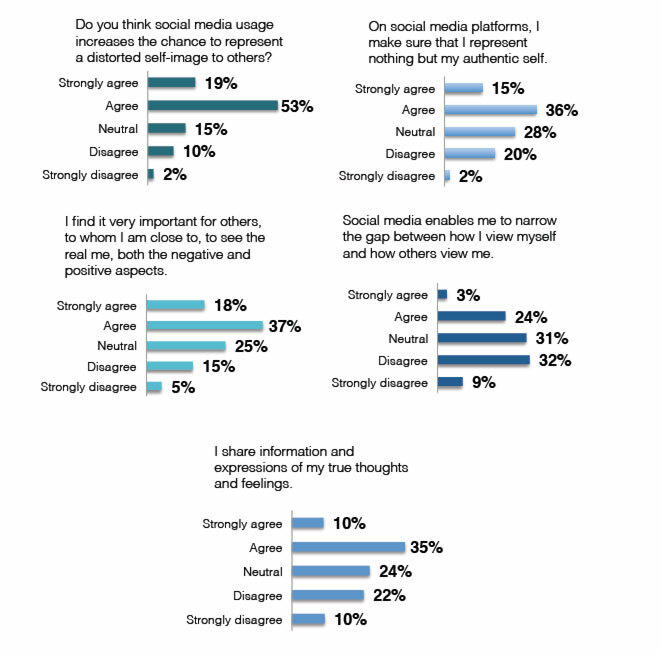 Although the survey sample and analysis is limited, it is interesting how the individuals in this survey perceive social media presences to be likely to be distorting for others, but not themselves. This is an issue not exclusive to the millennial generation; the experiences we have, and the expectations of others, do distort the way we see ourselves and others. Whether the perception that we are more authentic than others can be attributed to the Actor-Observer effect or the Hawthorne Effect (or both); the fact is we change our behaviour when we are being watched. Constructive Authenticity is a dimension of authenticity that looks at authenticity in reference to the cultural context. On Facebook, there are expectations around appropriate behaviour. Acting in accordance with those rules is not inauthentic; in fact to act against those norms may be considered inauthentic (as though you were doing something to intentionally upset someone else). However, the argument that Bertoncini and Schmaltz seem to be making is that millennials are confusing their online personas with offline ones. Perhaps partly because people may be pressured to be as happy and gorgeous offline as they portray themselves to be in social media? Existential Authenticity is a dimension of authenticity discussed in several posts on this blog. One aspect of existentialist philosophy is addressing the pressure we feel from others to be a certain way. Cultural programming is strong, and can create anxiety when our inner selves do not align with the outer selves we portray–and a main cause of that anxiety is the expectation of others. Certainly social media has become the root of much more anxiety than we have had in the past. Growing up with it, millennials have an almost inevitable draw to use social media, no matter how it makes them feel. This question around identity will inevitably spill out into what millennials perceive as authentic as well. Although marketers view every generation as a segment with their own specific attributes based on a variety of factors, perhaps it is time for marketers to attempt to quantify and analyse this type of “distortion” in regards to authenticity and the affect it has on the millennials’ perception of it. Generally I don’t reblog posts, however this post combines the philosopher Heidegger and is a great description of Existential Authenticity. Authenticity is perhaps one of the most over-used buzzwords in marketing, but what does it really mean? And why is it important? Some people will describe for you in detail how to come across as authentic in your messaging, why it’s important to be authentic to your customers, or why authenticity is the holy grail of marketing. At the same time, others will tell you never to be authentic or why people simply don’t want the “real” you. But these sorts of approaches tend to focus more on aspects of authenticity rather than getting to the core of the issue. More than just a habit worth practicing, choosing authenticity results in competitive advantage, especially when it comes to brand messaging and connecting with customers. Below are two reasons why. The purpose of this blog is to consider authenticity in areas related to marketing from a holistic perspective, based on the 360 Degree Authenticity framework (360da).